Consolidated Engine to Complete Vehicle Assembly Lines Created at Iwata Main Factory | Yamaha Motor Co., Ltd.
Yamaha Motor Co., Ltd. (hereafter “the Company”) completed the relocation of its motorcycle and snowmobile engine assembly lines from the Company's Iwata South Factory (800 Tenryu, Iwata City, Shizuoka Prefecture) to the Company's Iwata Main Factory (2500 Shingai, Iwata City, Shizuoka Prefecture) at the end of August, 2011. 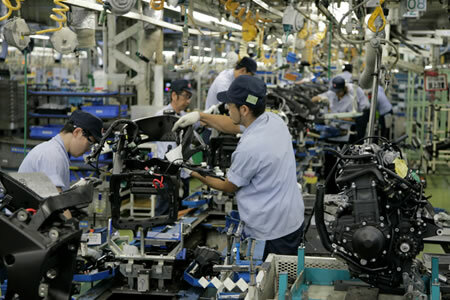 This relocation has consolidated what were formerly 12 engine assembly lines at the Iwata South Factory and nine complete vehicle assembly lines at the Iwata Main Factory (total of 21 lines) into four integrated engine to complete vehicle assembly lines and two small lot assembly lines (total of six lines) at the Iwata Main Factory. With this move, the complete assembly process for motorcycles and snowmobiles is now completely consolidated in one location at the Iwata Main Factory. Under its current three-year medium term management plan running through 2012, the Company has been working to reorganize the manufacturing layout in Japan and reform the Company's management foundation with the aim of being able to maintain profitability. In the engineering and manufacturing operations in Japan concentrated primarily on products for the Japanese, European and North American markets, the Company has undertaken a shift from the previous “market sized-dependent” operating model to “break-even-point” operations. This reorganization is based on a business model in which the break-even point is set at 200,000 units for motorcycles, 230,000 for outboard motors and 100,000 for ATV/SSV products. Traditionally, the Company's manufacturing operations were conducted separately for motorcycles, outboard motors and the other product lines and the manufacturing layout was divided by function into separate parts manufacturing, engine assembly and complete vehicle assembly operations at specialized factories. Under this system, productivity was pursued on an individual factory basis. However, this traditional type of manufacturing system had limitations in terms of overall productivity when applied to a “break-even-point” operating model of the type the Company is now pursuing. Under the current plan to reorganize the manufacturing layout in Japan, the Company aims to improve the operating rate of production lines, the efficiency of logistics and production management and strengthen technical capabilities. The focus of these efforts is to achieve (1) Concentrated Parts Production, (2) Integrated Assembly and (3) Consolidated Production Management and reorganize the overall manufacturing layout into one with aggregated and consolidated factory facilities. In specific terms, this will involve aggregating and consolidating the original 12 factories/25 units into 7 factories/14 units. With the August completion of the relocation of the Iwata South Factory engine assembly operations, the consolidation has progressed to 10 factories/18 units.